Hey everyone! It's hard to believe that summer is almost here! June is just around the corner. I thought that now would be the perfect time to do an Instagram roundup of some of my favorite Instagram post that didn't make it to the blog. You may have noticed that I've been making a few changes around here. I've kept this little blog of mine a secret for a long time and this year, one of my goals is to grow my following and share my blog with others. I'm pretty shy and I'm not always comfortable putting myself out there, but I do put a lot of time and effort into my blog, so I figured why not share my hard work? The one place I've been putting a lot of time into growing my following and promoting my blog is on Instagram. I love Instagram, but it's hard work trying to get followers, especially when I really don't have the tons of extra time for social media. 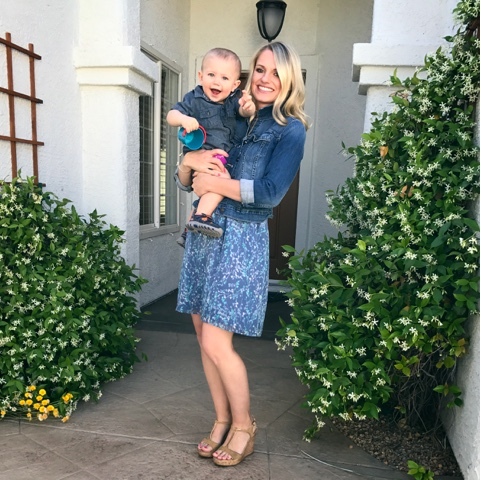 Motherhood and my job take up the majority of my time, but since I enjoy blogging so much, I try to make the time for it. I love trying out new beauty products. 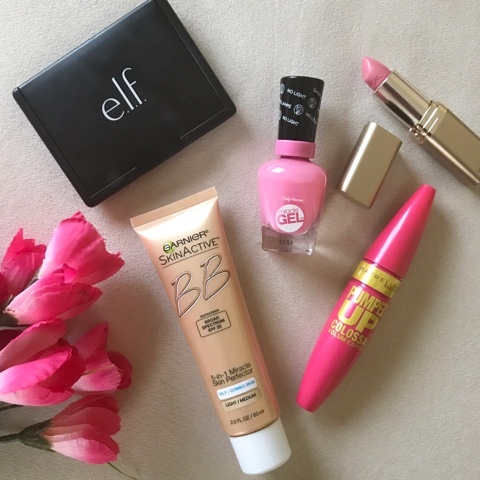 This spring I tried out a few new products and stuck with a few of my favorites. I'm really loving anything pink right now! Our Easter was nice and quiet. I had a week off work, which was amazing!! We spent the first part of my break in Denver visiting my sister in law, then we came home and finished off the week just relaxing and enjoying the weather. I even got a cute picture on Easter with my cute little guy. Pool season has officially arrived and I finally got the chance to wear this cute polka dot bikini that I bought at the end of the summer last year at Walmart for only $2! I made a few trips to Old Navy this spring to stock up on some super cheap tank tops. I've been loving my $2 tanks that I bought at the end of April. They are perfect for wearing under my cardigans with jeans. I've been learning what it's like to take a busy toddler to the pool, and let's just say that my summers at the pool aren't as relaxing as they used to be, but that's okay. That's mom life for you. I'm loving my new pool hat. I found this one in the dollar section at Target for $5. It's the perfect pool accessory. My go to outfits this spring have been dresses with my denim jacket. It's such a comfy and also safe look, especially when I feel stumped on what to wear. I've rediscovered my love for the color pink this spring. I just love this bright pink tank top. I especially love it with turquoise accessories. My poor baby had an ear infection over Mother's Day weekend, so he was very cranky. We had a hard time getting a good picture, but that's okay, because he's still cute, fussy or not. Now that it's pretty much summer, I have to break out the shorts. I don't really like wearing shorts, but it's really hard to wear long jeans when it's over 100 degrees, so it looks like I'm going to have to embrace my shorts. So that's my life through Instagram. Don't forget to follow me for the latest posts! Good shorts are so hard to find! ugh. 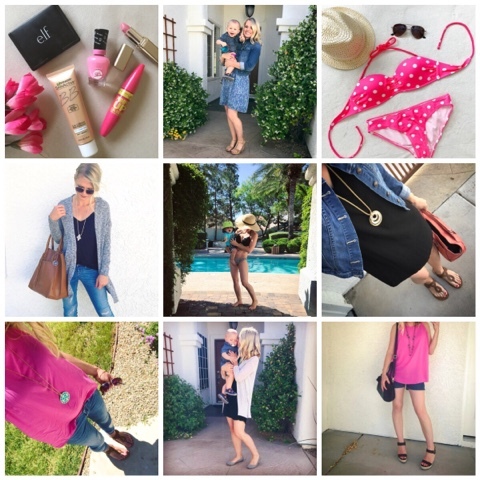 Your outfits and blog are super cute, I love that you share how to find/put together the outfit you're wearing. I'm not a pink girl but summer is getting me excited for all sorts of bright colors! That pink polka dot swimsuit is totally adorable! What a fun round up! I love the pink polka dot swimsuit, such a cute print! Great photos! Thanks Justine! I thought so too! I love the outfits! The one with the big bag is my favorite and I need to get one of those! I love your style! And that BB cream is the best! I've been using it for so long and can't imagine wearing anything else. Super cute outfits! Old Navy tank tops are the best!